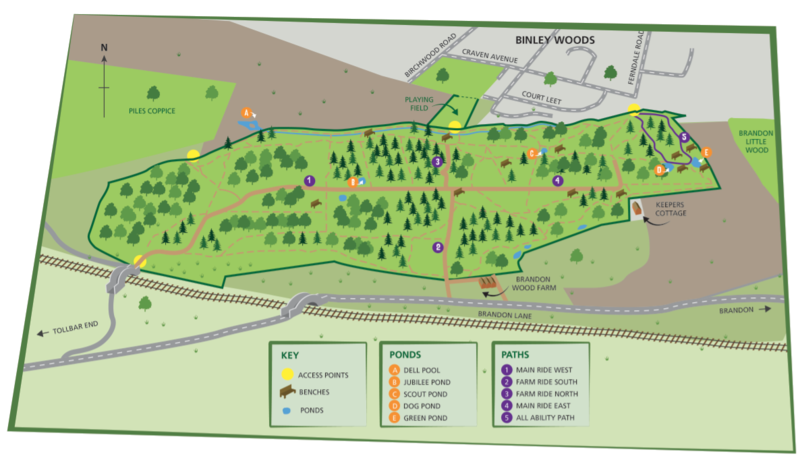 The wood is accessible in Binley Woods from Ferndale Road or through the playing field off Craven Avenue or Birchwood Road. Brandon Wood can also be accessed from Brandon Lane opposite the entrance to Brandon Marsh Nature Reserve where there is a car park. There is an extensive network of footpaths, several of which are suitable for wheelchairs. Motorised vehicles and horses are not permitted. Dogs should be kept under control and their refuse placed in the bin provided. Care should be taken to prevent fires. Walkers in the Wood, when any serious incident occurs such as a motor cycle being driven or any guns being used, should call either 01926 415000 or 01788 641 111 right away and ask for the Control Room. They will be aware of Brandon Wood which has Priority Status, and the Police will come out as soon as possible to investigate.